TurtleBot3 is a new generation mobile robot that is modular, compact and customizable. Let’s explore ROS and create exciting applications for education, research and product development. The goal of TurtleBot3 is to drastically reduce the size and lower the price of the platform without sacrificing capability, functionality, and quality. Optional parts such as chassis, computers and sensors are available, and TurtleBot3 can be customized in various ways. TurtleBot3 is willing to be in the center of the maker movement by applying the latest technical advances of the SBC(Single Board Computer), the Depth sensor and 3D printing technology. 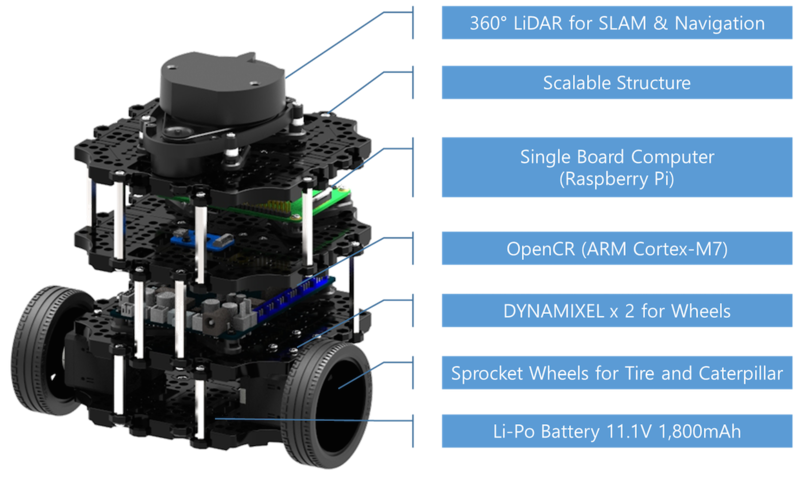 TurtleBot3 is a collaboration project among Open Robotics, ROBOTIS, and more partners like Intel, Onshape, OROCA. The Open Robotics is in charge of software and community activities, while ROBOTIS is in charge of manufacturing and global distribution. We need more partners who can provide technology, educational service or distribution in each country. TurtleBot is the most popular open source robot for education and research. The new generation ‘TurtleBot3’ is a small, low cost, fully programmable, ROS based mobile robot. It is intended to be used for education, research, hobby and product prototyping. TurtleBot was developed to meet the cost-conscious needs of schools, laboratories and companies. TurtleBot3 is the most affordable robot among the SLAM-able mobile robots equipped with a general 360-degree LiDAR. The dimension of TurtleBot3 Burger is only 138mm x 178mm x 192mm (L x W x H). Its size is about 1/4 of the size of the predecessor. Imagine keeping TurtleBot3 in your backpack and develop your program and test it anywhere you go. The TurtleBot brand is managed by Open Source Robotics Foundation, Inc. (OSRF), which develops and maintains ROS. Nowadays, ROS has become the go-to platform for all the roboticists around the world. TurtleBot can obviously can be integrated by the existing ROS-based robots, but basically can be an affordable platform for whom want to get started learning ROS. TurtleBot3 encourages users to customize its mechanical structure with some alternative options: open source embedded board (as a control board), computer and sensors. Turtlebot3 Burger is a two-wheeled differential drive type platform but it is able to be structurally and mechanically customized in many ways: Cars, Bikes, Trailers and so on. Extend your ideas beyond imagination with various SBC, sensors and motors on a scalable structure. 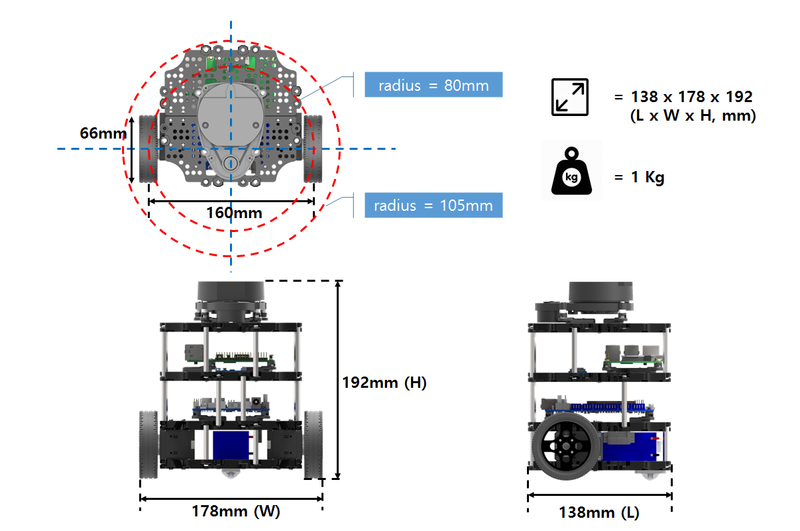 TurtleBot3 is able to get a precise spatial data by using 2 DYNAMIXELs in the wheel joints. DYNAMIXEL XM series can be operated by one of 6 operating modes(XL series: 4 operating modes): Velocity control mode for wheels, Torque control mode or Position control mode for joint, etc. DYNAMIXEL can be used even to make a mobile manipulator which is light but can be precisely controlled with velocity, torque and position control. DYNAMIXEL is a core component that makes TurtleBot3 perfect. It is easy to assemble, maintain, replace and reconfigure. The control board is open-sourced in hardware wise and in software wise for ROS communication. The open source control board OpenCR is powerful enough to control not only DYNAMIXELs but also ROBOTIS sensors that are frequently being used for basic recognition tasks in cost effective way. Various sensors such as Touch sensor, Infrared sensor, Color sensor and a handful more are available. The OpenCR has an IMU sensor inside the board so that it can enhance precise control for countless applications. The board has 3.3V, 5V, 12V power supplies to reinforce the available computer device lineups. TurtleBot3 Burger uses enhanced 360° LiDAR, 9-Axis Inertial Measurement Unit and precise encoder for your research and development. TurtleBot3 Waffle is equipped with an identical 360° LiDAR as well but additionally proposes a powerful Intel® RealSense™ with the recognition SDK. This will be the best hardware solution for making a mobile robot. We are an official and authorized distributor for TurtleBot3. Feel free to ask us information about prices, features and add-ons for this platform! Obviously, we can also provide you support for your ROS applications and for the configuration of your TurtleBot3!